"Quantum of Solace" has a hard target to beat as the previous film, "Casino Royale", smashed James Bond box-office records and brought in $594m globally. Daniel Craig's second outing as 007 has some advantages though: it will face less competition at the box-office, the shorter run time will allow more showings at theatres, and its delayed release in the US positions the film over the lucrative holiday season. MI6 projects that "Quantum" will marginally surpass "Casino" totals in North America as Craig's first outing slightly under-performed in US theatres but was tremendously popular on DVD and Blu-Ray. Progress in the UK will tougher despite record openings and a short-fall will hurt international totals. Bond proved critic-proof as mixed reviews failed to impact negatively on its record breaking opening weekend, but drop off will be greater than "Casino" as word of mouth is not as positive. The Royal World Premiere was held in Leicester Square in London on Wednesday 29th October 2008. Over £500,000 was raised for the two charities selected by Princes William and Harry. 55 regional charity premieres were held across the UK the next day on Thursday 30th October. "Quantum of Solace" has made box office history on its opening day in the UK, taking a staggering £4.94m and making it the biggest Friday opening of all time (Friday 31st October). This shatters the previous record held by Harry Potter and the Goblet of Fire, which took £4.025m. "Quantum", the latest installment from the longest running franchise in film history, has also beaten the opening day figure for the last Bond movie, Casino Royale, which took £2.9m on its opening day. The film opened in 542 cinemas (1,150 screens) in the UK and Ireland on Friday 31st October and will release in the US on November 14th. The film made box office history for a second time on the same weekend as it opened to an incredible £15.4million at the UK box office making it the biggest weekend opening of all time. This smashes the previous record held by Harry Potter and the Goblet of Fire, which took £14.93million over the same period. Daniel Craig's second outing as 007 becomes the most successful opening of any Bond film ever as it has also beaten the opening weekend figure for the last Bond movie, Casino Royale, which took £11.4m on its opening 3-day weekend. A 22nd installment in the lucrative 007 franchise, now the joint property of Sony and MGM, the Daniel Craig starrer opened two frames earlier in many foreign territories and totes a $252 million international cume. Sony is handling physical distribution of the film worldwide, but MGM was a 50-50 participant in its $200 million in production costs. The previous-best domestic debut for a Bond film was the $47.1 million registered by 2002's "Die Another Day." The franchise's top domestic theatrical run has been charted by "Solace" predecessor "Casino Royale," which rung up $167.4 million in U.S. and Canadian coin after unspooling in November 2006. "Audiences have embraced him, and domestic audiences were champing at the bit for the film," Sony distribution president Rory Bruer said. "It's certainly gratifying, to say the least." The Marc Forster-helmed film played to audiences comprising 54% males, with 58% of patrons age 25 and older. Fangirls of all ages scored their biggest box office victory yet in delivering a $70.6 million opening for Summit Entertainment’s teen vampire romance “Twilight” at the domestic box office. “Bolt,” grossing an estimated $27 million from 3651 runs, ended the weekend in a virtual tie with James Bond holdover “Quantum of Solace,” which grossed an estimated $27.4 million from 3,458 for a 10-day cume of $109.5 million, according to Rentrak. “Quantum,” like other holdovers, saw steep declines due, at least in part, to “Twilight.” Bond pic fell 59% from opening weekend, far more than predecessor “Casino Royale.” But Sony’s hardly complaining; through Sunday, “Quantum’s” worldwide total was $418 million. "Quantum" added 7 screens to it's launch week, playing on 3,458 locations in its second week. "Quantum" struggled in its third week in the USA against new release "Four Christmases" which gathered $31.1 million over the three-day weekend on approximately 4,600 screens at 3,310 locations for a five-day tally of $46.1 million. Bond was pegged back in to fourth place behind kids movie "Bolt" which jumped to second over the holiday weekend with $26.6m, and "Twilight" in third place - which suffered flame-out after it's big opening and bled a 62% drop-off to take $26.3m. "Quantum of Solace" took $18.8 million in its third weekend, down 29 percent for $141.4 million in 21 days. The screen count over Thanksgiving went up to 3,501. The other recent Bond pictures had their third weekends on the slow post-Thanksgiving timeframe, so there is no direct comparison, but it is clear that Quantum has not been displaying the staying power of Casino Royale despite the bigger opening. "Quantum" was up on Thursday and Friday compared to the previous week, but suffered on the weekend. As had been expected, the 22nd James Bond film lost some of its screens this weekend in North America as the box-office crowds around 007 in the top ten. On its fourth weekend in the USA and Canada, "Quantum of Solace" slipped from #4 to #5 in the box office and dipped to 3,423 engagements - down from its peak of 3,501 the previous weekend. "Quantum" is still enjoying more screens than its predecessor "Casino Royale", which only had 3,161 after the same time on release back in 2006. The combination of the record opening for Daniel Craig's second outing as 007, and a higher theatre count, means that "Quantum" is outperforming "Casino" - $151,620,134 versus $129,020,082. "Quantum" crossed the $150m barrier in North America after 24 days on release, compared to the 43 days that "Casino" needed. Quantum of Solace opened in 3,451 theatres on opening weekend. Above figures include Canada. The film did not play in theatres mid-week towards the end of its run (Jan 12th to 15th, Jan 20th to 22nd) and ended its run on Jan 25th taking $54,513 on 272 screens after 73 days on release. "Quantum of Solace" finished #6, earning $3.8m over the weekend and $157.6m since it opened five weeks ago. The film saw its screen count slashed from 3,423 last week to 2,635 engagements this week. Science fiction thriller "The Day the Earth Stood Still" swept the North American box office on its debut weekend taking approximately $31m. Although "Quantum" is ahead of "Casino" after the same number of days on release in North America and is expected to surpass the record for Craig, its drop-off is steeper. Quantum of Solace", has clung on to a top 10 spot at the US box-office this weekend as the slate of films at theatres ramped up ahead of the holiday season. "Quantum" took an estimated $2.2m over the weekend and landed at #10. Exact figures will be released Monday night. The film's theatre count fell by 761 to 1,874 screens. The weekend puts "Quantum" at an estimated $161.3m for North America, just $6m short of the record set by "Casino Royale". With a wave of five new films and a slash in its screen count, "Quantum" dropped out of the top 10 in North America for the first time. The 22nd 007 adventure was down to #17 with 891 screens over the Christmas weekend, a loss of 983 engagements. In comparison, "Casino Royale" was still going strong with 1,543 screens after the same period on release. Week 7 added $3.1m to "Quantum"s total which stands at $164.3m after 45 days, closing the gap to only $3m from its predecessor. The "Quantum" drop-off is substantial compared to "Casino" which scooped $9.8m in its seventh week. "Quantum" clung in to the North America top 20 in its eighth week at #20, taking $1.13m over the three day period down 19% from the previous weekend. "Casino Royale " managed to scoop over $3m on the same weekend. Importantly, the film also kept its 891 theatre count from the previous week, ensuring it will still be on wide release in to mid-January. After 52 days on release, "Quantum" has a total North America box-office gross of $166,820,413 - $7m more than "Casino Royale" had grossed after the same time. "Quantum" is expected to surpass "Casino"'s final US box-office total this week. 9th January - As projected by MI6 before the film opened, "Quantum of Solace" has raked in $167.1 million at domestic box offices becoming in current dollars the highest grossing James Bond movie in the United States and Canada, the studio behind it told Reuters on Thursday. The film surpassed 2006's "Casino Royale," the previous Bond movie, which made $167 million in the United States and Canada. "Casino" still holds the worldwide box office record for the franchise with $594.2 million. "It is always gratifying when the audience responds to a film, but to be working with a character as successful as James Bond and see the two films Sony has handled become the two most successful films in the history of the franchise makes us all tremendously proud," Sony Pictures worldwide marketing and distribution chairman Jeff Blake told Screen Daily. Weekend Commencing 31st October (Week 1) - Early news from France indicated "Quantum" would report a record opening weekend there, too. The film opened on Friday to unprecedented crowds. After only 24 hours on release, "Quantum" clocked up 101,922 tickets in Paris alone. Cinema managers across the country confirmed record attendances at their establishments. Launching in only three overseas markets, "Quantum" drew a spectacular $38.6 million from 2,123 screens and claimed the No. 1 spot easily. In its five-day premiere in France, "Quantum" pulled $10.6 million from 824 sites (a per-screen average of $12,864), which Mark Zucker, Sony's president of international distribution, said is a market boxoffice record for the series. In Sweden, "Quantum's" opening figure was $2.7 million from 149 situations (a per-screen average of $18,121), 31% bigger than "Casino's" bow in that market. Referring to the $38.6 million weekend figure accumulated in "Quantum's" three markets, Zucker said, "No other international release in 2008 has grossed more (playing in) fewer than 27 territories." "Quantum" pulled in an amazing $107.1 million from 9,870 screens in 58 markets, lifting the Sony-MGM entry to a two-weekend cume of $161 million following last week's kickoffs in the U.K., France and Sweden. The overseas action augurs well for Friday's domestic blastoff. With the exception of Turkey, where it was edged by a local film, "Solace" easily took the No. 1 spot in all the markets it played, setting all kinds of new records along the way. It represented the second-biggest international opening of 2008, coming in behind the $146.5 million registered by Warner Bros.' "Indiana Jones and the Kingdom of the Crystal Skull." All films currently reporting international grosses are earning about 15%-20% less -- depending on the territories now playing -- because of the strengthening of the dollar against local currencies. It's estimated, for example, that "Solace's" weekend take might have reached $118 million under the weaker dollar of several weeks ago. Over the weekend, Germany was Bond's biggest fan, grossing $14.9 million from 1,109 screens. China grossed $9.6 million from 1,251 screens, hailed as the second biggest non-Chinese opening ever behind Sony's own "The Da Vinci Code." India grossed $3.5 million from 570 screens for the country's biggest non-India opening ever, according to Sony International. And Switzerland grossed $3.9 million from 172 screens for the biggest opening weekend in the market's history. James Bond remained ruler of the foreign box office, as "Quantum of Solace" again dominated the weekend, gunning down $56.1 million at 10,460 playdates in 67 markets. Underlining the international appetite for Bond, "Quantum of Solace" has cumed a dazzling $251.6 million overseas, with Australia, Japan and Spain still to open. Mark Zucker, president of Sony's international distribution arm, pointed to impressive holdover numbers and predicted "Solace" will pass the $430 million foreign total for "Casino Royale" to become the top Bondpic internationally. Sony-MGM's "Solace" declined 47% from the previous frame, when it posted the 11th highest international weekend, with $107 million. It led in all but six territories, with nearly all of its coin from holdover markets, and already has topped the final totals for "Casino Royale" in 13 markets. The U.K. led the "Solace" parade, with $8.6 million -- just a 41% decline in its third weekend-- for a $64.1 million cume, followed by Germany with a 37% decrease to $8.3 million in its second weekend and China, off 41% to $4 million in its second frame. Russia slid 62% in its soph sesh to $3.6 million, and the third French frame declined 52% to $3 million for a $26.7 million cume. "Solace" showed impressive traction in Switzerland, off only 20% to $2.4 million in its second weekend after setting a record opening. Several other markets showed similar second-frame holding power, with South Korea off 39% to $2.1 million, Holland down 30% to $1.6 million and Brazil declining 36% to $1.4 million. The Bondpic also scored solidly in its Mexican launch with $2.4 million, 80% higher than "Casino Royale." It launches next weekend in Australia -- where it held its 10th foreign premiere Saturday in Sydney -- along with South Africa and Spain. The overseas run ends Jan. 24 in Japan. James Bond stayed dominant at the international box office for the fourth consecutive weekend as “Quantum of Solace” gunned down $40.6 million at 10,400 playdates in 72 markets. "Solace” has already become the year’s sixth highest overseas grosser, with $309 million, ranking No. 56 on the all-time list. Among Bond movies, it trails only “Casino Royale” (2006), which grossed $430 million internationally. “Solace” scored its top figures with a $7.9 million launch in Australia, 44% higher than “Casino Royale”; and in its Spanish opening with $5.1 million, 36% above “Casino.” Its fourth British frame stayed sturdy with $4.4 million, off 44%, for a U.K. cume of $71.4 million. “Solace” continued showing solid traction elsewhere with its third German weekend off 47% to $4.3 million for a $32.3 million total. France declined 45% in its fourth frame to $1.7 million, lifting the French cume to $28.8 million. China saw “Solace” skid 63% to $1.3 million while South Korea declined 47% to $1.1 million and Switzerland fell 49% to 1 million. The Swiss cume has hit $8.1 million, making it the highest-grossing film this year in that market. "Solace,” which opened most of its markets two weeks ago, will launch in New Zealand this weekend. Its final markets will be Venezuela and Uruguay in December and Japan in January. James Bond stayed strong at the international box office as "Quantum of Solace" racked up its fifth straight weekend victory with $20.1 million at 8,755 playdates in 73 markets. "Solace" managed to win easily even though it took a 50% hit as rivals began going head to head with 007 -- notably in Australia, where its second Australian frame slid 64% to $2.8 million to finish well behind a solid $5 million launch for Baz Luhrmann's epic "Australia." "Solace" also finished second in the U.K., off 47% in its fifth weekend to $2.4 million, while domestic winner "Four Christmases" easily topped the chart with $3.5 million. "Solace," which has kept Hollywood studios on pace to match 2007's record of $9.5 billion in overseas grosses, posted the lowest first-place figure since "Eagle Eye" led with $11 million five weeks ago. Outside the U.S. "Solace" has totaled $340.1 million -- more than 70% of its worldwide cume of $482 million. It's shown longer legs overseas than domestically and joins "Mamma Mia!" as the only titles to win five international weekends this year. "Solace" also scored $2.3 million in its fourth German frame and took in $2.1 million in its second Spanish session, declining 60%. Foreign cume has hit $340.1 million, led by $75.5 million in the U.K., $35.3 million in Germany and $30.1 million in France. "Quantum of Solace" remained on top of the box office in Asia by virtue of its wide release, ahead of "Red Cliff," currently showing only in Japan. 007 collected $5.56 million in its fourth frame for some territories and was showing mid-chart fatigue in most. Pic was on top in only Taiwan and Indonesia. In New Zealand where the film opened for its debut weekend, Bond shot straight to number 1 in the national chart with a cool $1.5m. Only three territories remain: Venezuela, Uruguay and Japan. “Madagascar 2” ended the five-weekend winning streak at the foreign box office for Sony-MGM’s “Quantum of Solace,” which gunned down solid $10.8 million from 6,350 screens in 72 markets greeted "Quantum of Solace" as it slid to second place during its seventh week of international release. The film's sole new opening saw Venezuela bring in $415,000 from 75 screens, hailed by Sony as 98% bigger than the comparable bow for 2006's "Casino Royale." "Quantum's" international cume stands at $357.8 million. Market grosses include $77.4 million in the U.K., $30.8 million in France and $37.1 million in Germany. The 22nd James Bond pic has totaled $357.8 million outside the United States and, with $151 million domestically, it’s become the 61st title to take in half a billion dollars worldwide. Bond still remained a force at the international box office, with "Quantum of Solace" raising its overseas total to $367 million after a weekend take of $5.2 million from 70 markets. The film placed #3 internationally despite the lack of any major openings. The only fresh territory this week was the Dominican Republic, which opened with a weekend total of $70,262. Japan and Uruguay remain. 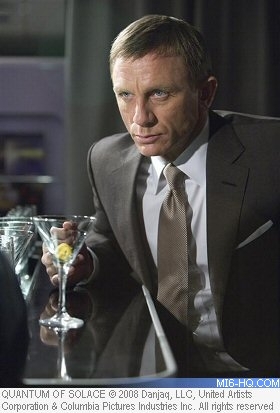 The former could be worth around $18m for 007 in the New Year. Quantum Of Solace boosted its tally with $2.9m from 2,730 screens in 68 markets to put it on $372.5m internationally. The film slipped out of the top five worldwide for the first time in about six weeks. Latest figures put the UK on $79,1m after eight weeks, Germany on $38.9m after seven and Australia on $17.6m and Spain on $11.7m, both after five. Holland has taken $7.8m after eight, Denmark $7.1m after the same amount of time, Norway $6.3m after seven, New Zealand $2.5m after four and Venezuela $1m after three. UK cinema admissions soared 40% in November as James Bond film Quantum of Solace and High School Musical 3 attracted people of all ages to the silver screen. In Germany, Bond helped give the nation's boxoffice a 24% jump in theatrical revenue in the fourth quarter. "Quantum of Solace" boosted its cume to $376.6 million by pulling in $2.2 million from 2,225 screens in 61 markets. The film finished 7th in the 2008 worldwide box-office with a haul of $527m. Uruguay debuts "Quantum" on Boxing Day. Japan is the last major territory to open for "Quantum" in January 2009. 7th January - James Bond has beaten Batman at the Swedish box-office during 2008. "Quantum of Solace", the 22nd adventure for 007, smashed "The Dark Knight" down in to third place with 702,426 ticks - an extra 170,000 ticket sales compared to the caped crusader. Unsurprisingly, "Mamma Mia!" - based on the ABBA musical - was the most watched film in the band's native country. Approximately 1 in 5 people in Sweden saw the film with 1,872,000 tickets sold. 9th January - 2008 ended with a 3.5% year on year increase in box-office takings and a year on year increase of 1.57% admissions in German cinemas, according to figures collated by Nielsen EDI. They generated box-office takings of $ 1.03bn (Euros 770m), an increase of 3.5% on the previous year's performance of $ 1bn (Euros 743.8m). Sony's latest James Bond extravaganza Quantum Of Solace was the year's top earner at the box office with $ 42.5m (Euros 31.5m). However UPI's Madagascar: Escape 2 Africa, which was only released on December 4, attracted the most admissions with 4.7m to December 31. "Quantum of Solace" opened nationwide in Japan this weekend, the last international territory for the 22nd James Bond film, and smashed box office records. According to Variety, "Quantum" raked in $6.5m in Japan in its opening weekend. That is the biggest opening for any 007 adventure and smashes the $3.25m bar Daniel Craig set with his previous film "Casino Royale" (2006). "Quantum" also earned $3m at sneak preview screenings in Tokyo on Saturday 17th & Sunday 18th January. In its second weekend in Japan, "Quantum of Solace", the 22nd picture in the James Bond saga, grossed $2.6m from 346 screens. The action packed adventure is sitting strong at #2 on the Japanese Box office with $12.7m in the kitty. In its international box-office battle, "Quantum of Solace" added $2.7m from 455 in 21 markets, bringing its 'international' (non-US) total to almost $398m. Taking into account these new figures, the total gross box-office of "Quantum of Solace" is stacking up at approximately $566m. In its third weekend on release in the country, "Quantum of Solace" has scooped a further $1.3m from the Japanese box-office. The 22nd James Bond film played on 346 screens. Currently, the overseas total (not including USA & Canada) stands at $401.6m - $30.5m shy of the overseas box-office record for a 007 title set by 2006's "Casino Royale." Due to different box-office reporting mechanisms around the world, Individual country totals may be updated less frequently and do not necessarily add up to the foreign totals.